Baby Kina and Saartje’s Bootees, X2! April was a whirlwind. There was illness, lengthy hospital stays, sleepless nights, extra responsibilities at work, and lots of fretting. Very little knitting or crafting. Fortunately everyone is on the up and up now, thank goodness! I’m delighted to put April behind us and move on to May. The only crafty casualty worth mentioning was my participation in the potholder swap this year, the first year I’ve had to miss out on the action. The deadline came and went, and all I had completed was the front of only one potholder. On the other hand, I was able to finish the Baby Kina sweaters I showed you last time, and even made matching Saartje’s Bootees! 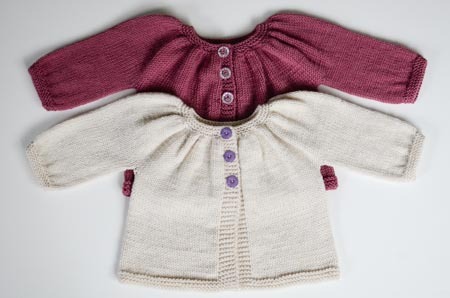 Pattern: Baby Kina by Muriela. I knit the 6 months size, with long sleeves. The recipients are due in June, so my hope is that they’ll be able to wear their sweaters during the fall and winter. Needles and finished dimensions: I used US 2.5 and US 4 needles, exactly as specified in the pattern. The sweaters have the following finished dimensions: 19″ chest circumference, 10″ from shoulder to hem, and 5″ sleeve length to underarm. Pattern: Saartje’s Bootees by Saartje de Bruijn. I knit the large size. No mods, except that I extended each strap by 2 stitches, and knit the buttonholes right into the straps. Needles and finished dimensions: I used US 2.5 needles. Both the yarn and the needles were larger than specified in the pattern, so my booties ended up being approximately 4″ from heel to toe. I hope this will work for a 6 month old (I think it will – the booties are pretty wide, and very stretchy!). Yarn: Debbie Bliss Baby Cashmerino; the rose is #036, and the off-white is #101. I used 2.5 skeins of each color to make the baby sweater plus booties. I was very pleased to find these perfect little buttons at my local Joann’s. They are nothing particularly amazing (sigh, Windsor Button, sigh), but they match the sweaters well, and came in both large and smaller versions, so I could use the same style for both the sweaters and the booties. Beautiful work. Let’s hope May is better for all of us. Gah! Dying of cuteness over here. There seems to be a rash if babies around here too, I need to get knitting! Sweet little baby clothes! I remember being pleasantly surprised by the button selection the last time I looked in JoAnn’s. Worth a look when inspiration hits. Oh, those are beautiful! I love how perfect the booties look.. such flattering executions of what look like a great patterns! Love those little sweaters! That bootie pattern is one of my very most favoritest. Great modifications you made, too. Glad everyone is back on track! I, too, loved Windsor Button when I lived in Mass. However, a friend took me to The Button Box in Wellesley. It’s not Windsor Button but they had an excellent selection of buttons when I went there…enough so that my stash still has lots that I couldn’t leave without. Just a thought. Lovely sweaters and adorable booties. Have you ever tried Fleegle’s seamless Saartje’s booties? Glad you found buttons you like – the JoAnn’s near me has significantly reduced their button section (sigh). There are other JoAnn’s around with a few more buttons, but nothing like they used to stock. Buttons are becoming my nemesis. How cute! 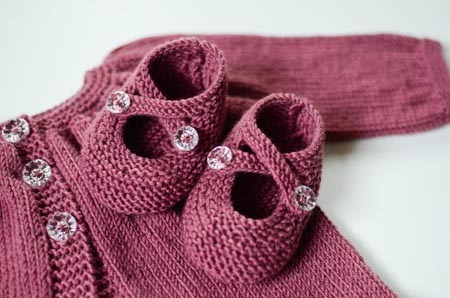 Both Baby Kina and Saartje’s Bootees regularly pop up in my Pinterest feed, I may just fall for the temptation now – love your versions! those Baby Kinas are gorgeous! 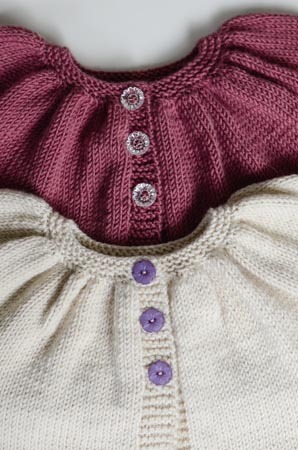 i love the soft gathers at the neckline – really sweet. and the booties are the perfect final touch. Love your color choices. Very nice! Your work is gorgeous. Wow, I hope everyone is healthy now and that work has calmed down! And that sweater! I think my new baby grand-daughter (still to be born, very soon!) is going to need one of those. I’ve already made a pair of those cute shoes, I love that pattern. And re: buttons. I was recently so disappointed at my local Joanns. I complained, the wall was nearly empty. I just can’t get to NYC as often as I need buttons! Thank you for this post! There’s a little niece coming into our family in August and I’ve been stumped as to what to knit for the wee lamb–these will be perfect! The sweaters and booties are TOO CUTE!! Switching subjects – I’m reading the news today (about the Ukraine and Odessa, specifically) & hoping that your family is safe. Oh my gosh – adorable!!! The colors are great and those booties are just the cutest. Very sorry to hear of all the troubles, but hope that things are rapidly improving. Your baby items are absolutely adorable! Love the colors too. I have enjoyed reading your blog for years. I am so sorry that you have had scary health issues in your family. Best wishes for good health for you all. Those turned out so sweet! Glad things are less hectic for you now. Hope it stays that way!